The following list of Captian Sir Samuel Brown's chain bridges and piers is a work in progress, and it may include non-suspension bridges owing to the sketchness of the information currently available. Only three of his chain bridges remain to us today. They are highlighted below. The reference codes relate to the source material. See the key at the foot of the page. 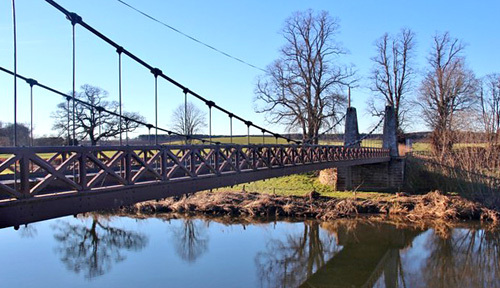 Samuel Brown's Kalemouth Suspension Bridge (c.1835) over the River Teviot near Kelso in the Scottish Borders. 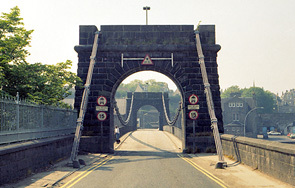 It is one of only three of Brown's chain bridges that have survived. Many were destroyed by flood or storm, and many were replaced in the 19th and 20th centuries. Another survivor is the Wellington Bridge (1831) over the River Dee in Aberdeen, Scotland. It was rebuilt in 1930 using steel suspenders and bearers.